Click here (pdf) or here (online) for the final Global Pet Obesity Initiative Position Statement approved by 22 International Veterinary Professional Organizations, including American Veterinary Medical Association Board of Directors, British Small Animal Veterinary Association, Canadian Veterinary Medical Association, World Small Animal Veterinary Association, and more. If your organization would like to join in support, click here. Come back in October to take the 2019 Pet Nutrition & Weight Management Survey for Pet Owners & Veterinary Professionals. In APOP's 2018 clinical survey, 55.8% of dogs and 59.5% of cats were classified as clinically overweight (body condition score (BCS) 6-7) or obese (BCS 8-9) by their veterinary healthcare professional. That equals an estimated 50 million dogs and 56 million cats are too heavy, based on 2018-19 pet population projections provided by the American Pet Products Association (APPA). In 2017, APOP found 56% of dogs and 60% of cats were overweight or obese. General pet obesity information and U.S. pet obesity survey results graphics. 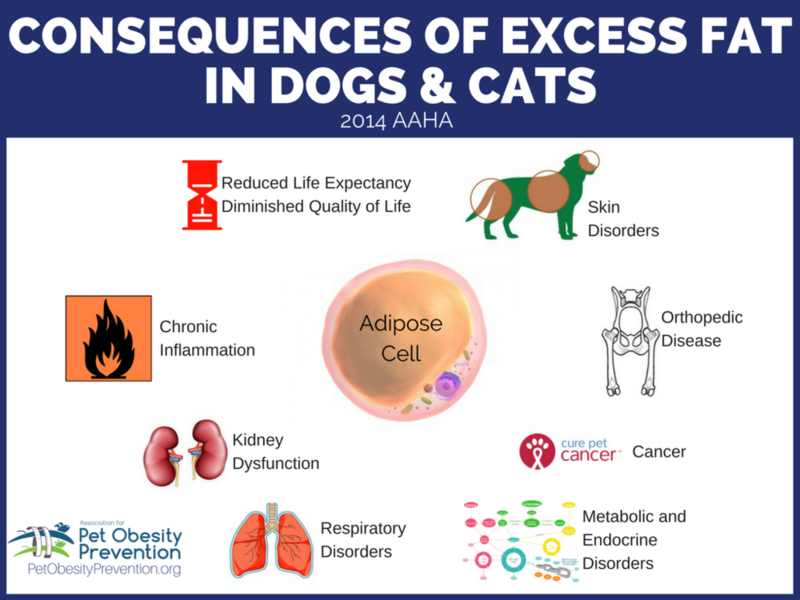 Set also includes previous pet obesity survey infographics, canine longevity study, AAHA Weight Management Guidelines, and consequences of pet obesity. Veterinarians typically recommend walking as a key element of most canine weight loss regimens. Sounds simple enough, but is it really? I have found that few dogs will naturally walk at a pace that generates the elevated heart rates needed for sustained aerobic activity. Of course, make sure your portly friend can begin a weight loss exercise program by having her examined by your veterinarian before beginning any physical activity program. Follow these helpful tips to pace your pooch for optimal weight loss. More pets are suffering from obesity. The latest data from the Association for Pet Obesity Prevention (APOP) reveals over half the nation’s dogs and cats are overweight or obese. With increasing weights come increased weight-related disorders, especially osteoarthritis and type 2 diabetes. It’s up to pet owners and veterinarians to reverse this trend and save our dogs and cats from suffering needlessly. While this task may be daunting and challenging to some, we can succeed. Here are a few tips on how you can help your pet in the quest to go from fat to fit in four steps. There’s a secret life of pets we don’t often talk about. The secret begins with the fact that over half the nation’s dogs and cats are now classified as overweight or obese by their veterinary healthcare provider. Nearly 59% of cats and 54% of dogs equaling an estimated 50.5 million cats and 41.9 million dogs are at risk for weight-related disorders. In addition to confronting pet obesity and its associated maladies and complications, I’ve also been uncovering another secret of pet obesity: Inflammation. In fact, I’d go as far as to say inflammation is the new obesity and is the real secret we need to reveal to both pet parents and the public. This is an incredibly important issue because pets with obesity are at increased risk for developing serious weight related disorders such as diabetes, arthritis, high blood pressure, kidney disease, cancer, and more. We must do better. To help you better care for your furry loved one, I’d like to share the top five questions you need to ask your veterinarian to keep your pet healthy. They’re simple, won’t embarrass you, and just may save a life.